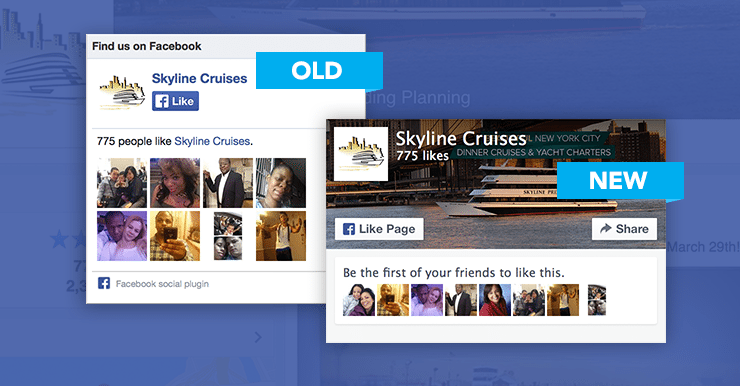 In case you missed it, Facebook quietly announced that they’d be getting rid of the old version of the Like Box plugin. This is the embedded Like Button that allows you to Like a Facebook page directly from a company’s website. Facebook suggests you start using the newer version of the plugin, the Page Plugin. It pretty much does the same thing, but it looks a little cleaner and can be customized a little more. Like we said, this version of the button can be customized a little bit more than the previous plugin. On this version Facebook allows you to choose how wide and tall you want the box to appear on your website. Also, you can choose to show your cover photo, or not, whichever you prefer. On top of that you can choose to show profile pictures of friends who also liked the page, and your most recent posts to the page. The new button also has a share feature. This allows users to share a link to the page on their own timeline or on a friends timeline. You have until June 23rd until the old plugin stops working. The change may seem insignificant in the ever changing world of Facebook, but most of the time it’s paying attention to the small things and making sure you’re doing everything right to see big changes in your social marketing strategy. Click here to read more about Facebook’s page plugin.